Day 2 of the 2018 Arizona Fall League marked the first win for manager Stubby Clapp’s Surprise Saguaros, as they edged Salt River in a slugfest. Five of eight Cardinals appeared, with Lane Thomas and Connor Jones leading the way. Results from the game played Wednesday, October 10th. The Saguaros (1-1) used 18 hits to overpower the Rafters (1-1), 11-9, on Wednesday evening, for their first victory of the early season. Eight of nine Surprise starters got into the hitting action, paced by second baseman Charles Le Blanc (TEX) who went 4-for-5 with a run scored and RBI. Left fielder Nick Heath (KC) and third baseman Vladimir Guerrero Jr had three hits apiece. 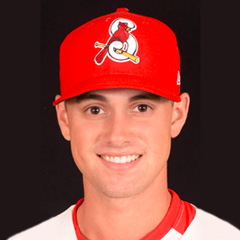 Right fielder Lane Thomas was St. Louis’ sole position player in the starting line-up. The number five batter singled twice in five at bats with an RBI in his first start. Thomas flied out to right in the first, leaving a runner at second, but came through the next frame when his sharp line drive single up the middle knocked in first baseman Yanio Perez (TEX). Another single advanced Thomas to second where he was stranded. After opening the fourth and sixth with a fly out to left and pop out to first, Thomas grounded a single to right to begin the eighth. Three subsequent outs left the 23-year-old on first. The Cardinals had far better representation on the mound although the four pitchers’ results were mixed. Evan Kruczynski (W, 1-0) tossed the first 2 1/3, yielding five unearned tallies with six hits, a ball and a hit batsman allowed. Four runs occurred in his initial inning of work and were unearned due to a throwing error by his battery mate on a swinging K by the initial batter followed by the first of the southpaw’s two miscues on attempted pick offs. Kruczynski worked around a lead-off single the next inning but ran into more trouble after another lead-off single and errant attempted pick off left his final runner at third. A 6-3 ground out brought that runner across, at which point the starter’s day was done. 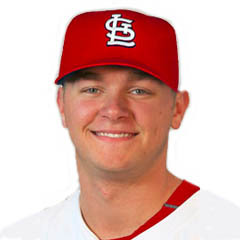 Connor Jones generated the best performance of the quartet, tossing two clean innings with one hit given up and one strikeout against the heart of Salt River’s lineup. Will Latcham followed Jones to the mound and navigated around a two-out seventh-inning double but was undone by back-to-back walks to open the eighth. Latcham retired his next two batters before exiting in favor of Conner Greene. But Greene’s effort was nothing short of horrific. The righty got out of the inning but not before allowing a hit and issuing four free passes resulting in two runs charged to Latcham and plus two more of his own. Royals right-hander Walker Shelter worked around a two-out single followed by a plunked batter for his first save.